← BabyWearing Review – Does it Work? Cleaning Mildew with Vinegar Review – Does it Work? White vinegar is a low cost, all natural and safe to use cleaner. Can it wipe out yucky mildew? Saves Money – oz for oz, white vinegar is a steal vs traditional cleaning products. It’s an even better deal vs high priced “natural” products. So there’s this spot in my bathroom that’s pretty yucky. I mean really yucky. So yucky that maybe I’ll tell you it’s in a friend’s bathroom because it’s just too embarrassing. Ahem. This spot must be destroyed immediately. Especially since a quick Google search suggests to me that it could be (bum ba ba bummmm) Black Mold. This is not especially surprising as my (friend’s) bathroom is completely unventilated. Enter my newest natural weapon: white vinegar. Quite a steal at $2.39 a gallon! 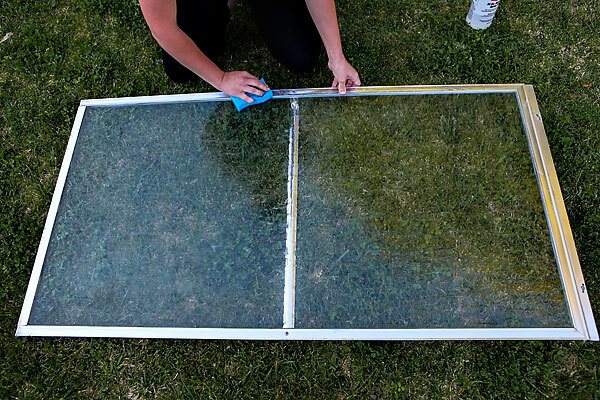 I got my strong husband to remove the glass shower doors where the mildew was creeping and take them out to the backyard. A quick spritz of vinegar, and a little attention with a scrubber sponge took care of the problem quite nicely. The three-year old happily hosed down the shower doors for me and they dried in the sun. Look at how great it turned out! I can shower without fear again! Overall, vinegar was an easy, cheap and effective tool against the mildew that was creeping around the edges of my shower. It also did a decent job of clearing up some of the soap scum on the glass shower doors as well. I’m thinking a whole series on cleaning with vinegar may be in order! Update: there is a strip of brown grass in my backyard where I did the cleaning. Perhaps a review of vinegar as a week killer is in order? What have you successfully cleaned with vinegar? Any ideas for what I should try next? 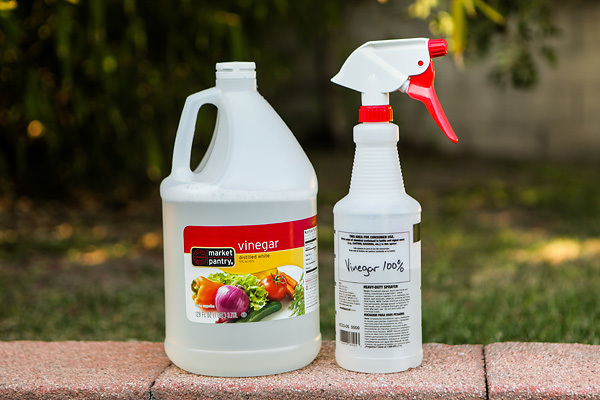 This entry was posted in Cleaning, The Power of Vinegar and tagged better for the earth, better for you, cleaning with vinegar, saves money, vinegar. Bookmark the permalink. 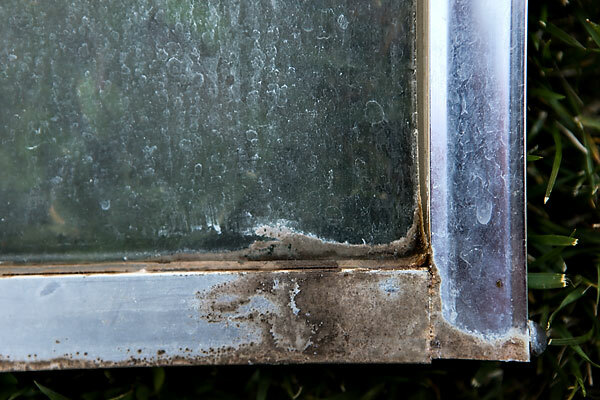 23 Responses to Cleaning Mildew with Vinegar Review – Does it Work? 12 years ago, my friend found a 4-drawer, legal-size, OAK filing cabinet set out for the trash because it had a small amount of mildew on one exterior corner. He didn’t need a filing cabinet, but I did. We wiped off the mildew with a rag soaked in vinegar, and we threw away the moldy-smelling paper folders that were inside. The mildew has never come back. I also wash my hair with vinegar, use it in the rinse-aid dispenser of my dishwasher, and add a shot to the sink of soapy water when hand-washing dishes–it reduces water spots when dishes air-dry, and it seems to help cut grease, too. Thanks for the tips Becca! I think I need to do a whole series on vinegar! White Vinegar for mold is great!I use Apple Cider vinegar as an astringent on my face mixed with Alum 1 teaspoon to 2 cups Vinegar.I also rinse my hair in Apple Cider Vinegar for shiny hair & Dandruff control!have a great day. This would be a great post to share on Wildcrafting Wednesday. I hope you’ll stop by. WOW! That first mildew pic looks just like my shower door. It looks so shiny now ! I will have to give this a whirl. Thank you! Thanks for checking in Christine! I am quickly falling in love with the cleaning power of cheap, white vinegar. I have some sidewalk weeds I’m eyeing to participate in the next vinegar challenge. Stay tuned!! Yes! Vinegar seems to kill anything. I’m not brave enough to use it in my garden — will probably stick to sidewalk cracks! I used vinegar on unwanted horsetail that was growing in front of our stone wall. I read that it simply raises the pH of the soil so much that plant life cannot grow there. It definition restrained the horsetail until enough rain diluted the vinegar in the soil. I’m a huge fan of vinegar too. I used to buy all these cleaning supplies, but as they run out, I’m not replacing them. Instead, I clean with vinegar, baking soda, and sometimes 7th generation dish soap w/ water. Thanks for the tip! What about on window sills? Vinegar doesn’t seem so effective on wood. I use it on painted window sills, but I’m not sure I would recommend to apply straight to untreated wood. Vinegar will also treat rust and turn it to black iron oxide which can be painted. You just have to sand the loose rust or grind it and then treat it with vinegar let it dry. Can treat metal several times if you want. I found this site looking for a way to treat mildew on car seat covers. I already have vinegar so I’m good. Some great ideas here. As a contractor and painter I always used bleach, especially if mold exposed to sun. Today I am dealing with mold problems on body etc. Tea tree oil in shampoo and on toe nails. Just started with white vinegar and am trying to learn. Great blog! I’ll be back. If I come across any breakthroughs elsewhere I’ll share.